General Rubber offers a wide range of resources to support our customers across multiple industries and sectors. We believe it is critical to provide detailed product literature, application tools, educational materials, and technical training so that our customers can make the best and most informed decisions. Rubber expansion joints (REJs) are primarily used to absorb all directional piping movements as well as reduce noise and vibration. In addition, they are a cost-effective means to relieve piping and anchor stresses, compensate for misalignment, and provide access to piping and equipment. Expansion joints play a critical role in piping systems providing necessary support and flexibility for many industries and sectors. When discussing REJs, the focus is typically on the quality, durability and capabilities of the REJ, however, selecting and applying the correct REJ for a given application is critical to ensuring the features and benefits of the REJ are realized. Improved performance and engineered solutions are accomplished by incorporating advanced materials and technologies into our product lines. General Rubber is proud to offer a variety of elastomers and construction materials chosen specifically to meet the needs for even the most demanding applications. General Rubber's catalogues offer an overview of our products available across multiple industries and sectors. They are designed to make it easy to view our standard products while also illustrating our capabilities for providing engineered solutions. General Rubber's data sheets illustrate key material and product characteristics in addition to their standardized performance. Additionally, these individual sheets can be utilized as basic submittal drawings for product approval and/or specification. Job specific drawings and/or specifications are available via our engineering services. General Rubber has created guidelines to provide the minimum requirements for engineering design, materials of construction, performance, dimensional information, and quality for each of our product categories. These guideline specifications are effective tools for utilities and EPCs to confidently specify the critical characteristics of these products. General Rubber provides installation and maintenance instructions for each of their product categories. These instructions are critical for the safety and reliability of the system, as well as to optimize the performance and service life of the product. General Rubber has created case studies to communicate our extensive capabilities across multiple industries and sectors. Good illustrations include our case studies on developing 12 foot diameter dismantling expansion joints for the world's largest common cooling water system (Ras Laffan, Qatar) and developing an all rubber in-line pressure balanced expansion joint, used within newly constructed AP1000 nuclear plants (VC Summer 2,3/Vogtle 3,4). 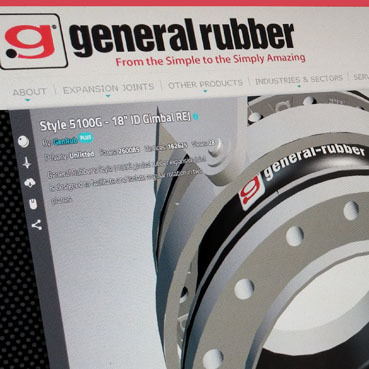 General Rubber has created application videos to illustrate the capabilities of each of our product categories including restrained and unrestrained expansion joints. These animations are helpful in illustrating our products role in best piping practice and optimization. General Rubber has worked with numerous flange standards applied across multiple industries and sectors. We have the experience working with and are pleased to provide dimensional information on these standards. Contact engineering services for information not shown on these tables. General Rubber is proud to have published numerous articles in major industry periodicals including Pumps & Systems, WaterWorld, and Maintenance Technology. These articles highlight the features and benefits of our performance products, selection and application, as well as implementing an efficiency and reliability program. We have collected some of the most common questions and answers to help you find relevant information as quickly and easily as possible.